Football Finishes with Best Record Ever, Tennis, XC and Volleyball Still Playing! This past week saw some exciting postseason action from many of our Harker teams and athletes. While seasons ended for some, others are still fighting to bring CCS – and maybe even state – titles back to Harker! The girls cross country team saved its best runs for last, placing eighth in the Division 4 Central Coast Section (CCS) Championships. Led by captains Niki Iyer, grade 11, and Alex Dellar, grade 12, six of the seven Harker runners ran personal bests on the Crystal Springs course in Belmont. Placing second, Iyer ran 17:26.0 to become the 26th all-time runner on the 44-year-old course; her time is also the eighth best run by a junior. Alycia Cary, Aneesha Kumar, Lilia Gonzales, Anika Rajamani, all grade 9, and Akshaya Vemuri, grade 10, helped the Eagles to their second best season in school history. Dellar and the team also accepted the CCS Scholastic Award for their 3.865 team GPA. The boys were also awarded a CCS Scholastic Award for their 3.792 team GPA. Iyer will now advance to the state championships in two weeks in Fresno. Girls tennis earned a first round bye in the team championship bracket, before defeating Sacred Heart Prep 4-3. Unfortunately, they fell to eventual CCS champion Menlo in the quarterfinals. But there is still more Harker tennis to be played as Pam Duke, grade 9, and Lizzie Schick, grade 10, will compete in the CCS doubles bracket Monday at noon. Duke and Schick are the No. 2 seed and open with Mountain View. Good luck girls! The Harker football season came to an end after a first round loss to Fortuna High School in the opening round of the North Coast Section (NCS) Division 4 tournament. However, it was a great season that saw Harker’s best-ever football record and only the second playoff appearance for a football team in school history. Harker football says goodbye to seniors Oison Coveney, Trenton Thomas, Miles DeWitt, and captains Johnathon Keller and Nikhil Ramgiri. The football program graduates only five seniors this year, so this young team should be competitive for a long time! Coming off a first round bye in CCS, the No. 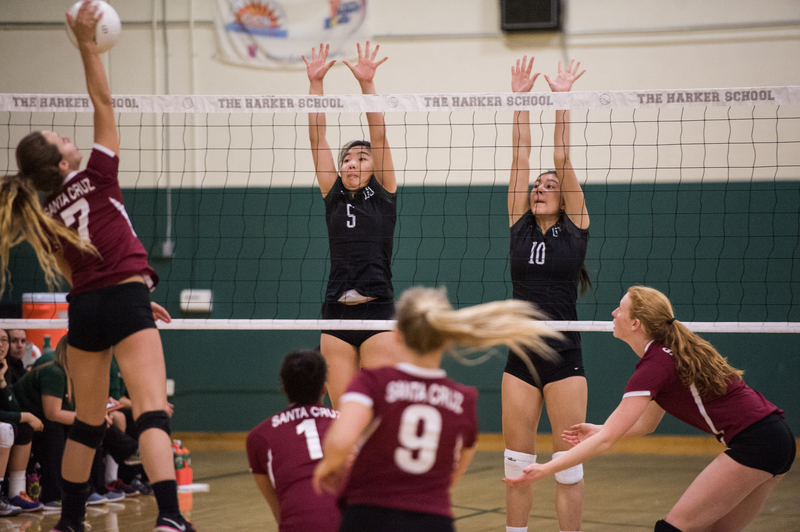 3 seeded girls volleyball team defeated Santa Cruz in three games (25-19, 25-20, 25-17) to move on to the semifinals it they will face league rival Menlo. The match will be played at Notre Dame Belmont High School tomorrow at 5:30 p.m. If the girls win, they play in the CCS finals this Saturday, which would include a trip to the NorCal Tournament. Students, if you would like to root for your Eagles, Harker is planning to provide transportation to and from the game for upper school students. A permission slip is required and you must sign up at the athletics office by 12:30 p.m. on Tuesday, Nov. 17, to reserve a seat. Good luck girls! After finishing third in CCS, Katherine Zhu, grade 10, ended the season shooting plus-12 at Crazy Horse Ranch and finishing tied for 28 among 83 golfers at the NorCal Championship. Congratulations on a great season Katherine!